Summer is a sensational time of year. Today I will be mentioning many different summer activities that are very easy to do and make. I hope you are inspired to build one of these activities at home! Kick crochet: Bored of playing out with nothing to do? Then try Kick crochet! All you will need are 3 hula hoops, two footballs and and two flags. Firstly, cut all three hula hoops in half and secure them into the ground. Secondly, place the flags into the ground behind all of the hula hoops and for extra support cello tape the bottom of the flags and the hula hoops to the ground. Then enjoy playing kick crochet in the sun. 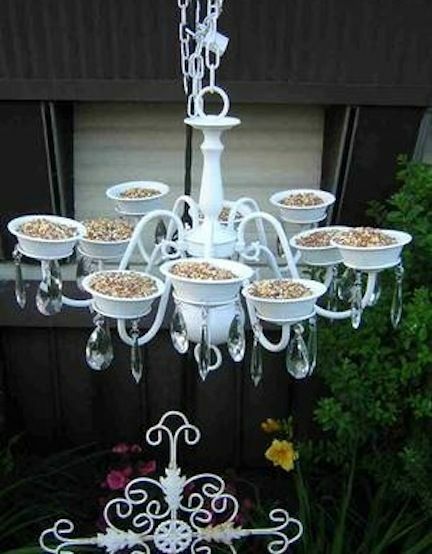 Chandelier bird feeder: All you will need to build this splendid bird feeder is a chandelier ( it can be an old chandelier if you like ) and some bird seed! Firstly fill in the spaces where the candles are supposed to go with your bird seed. Then you can hang the chandelier onto a wall or a tree outside and colour or paint it whatever colour you like. You can even add stickers! Cement stepping stones: To make these wonderful cement stepping stones you will need some cement, a large leaf and a shovel. Start by covering the leaf with cement. Then leave the leaf out overnight so that the cement drys. After that peal the leaf off the cement to leave a solid, leaf-shaped stepping stone! Dig out a hole in the ground with your shovel as to where you are going to place the stepping stone and repeat this until you have the right amount of stepping stones you need. Bookshelf sand pit: Do you have an old bookshelf in your house that you want to get rid of? Well there’s no need! 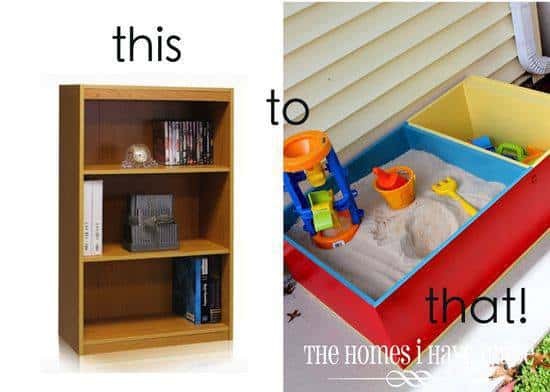 To make this sand pit you will need a three-shelved bookshelf, some sand and some toys to play in the sand with. First you will need to turn the bookshelf onto its back so that you can reach into the bookshelf. You can paint it first however you don’t have to. Take out all the shelves on the bookcase except one. If you have one part of the bookshelf bigger than the other fill in the bigger side with your sand however if you have the same amount of space on either side you can choose whichever part you want. Finally, put the toys in the other part of the bookshelf. 1. See-through, glass designs you can hang on trees. 2. Colourful garden lights out of light bulbs and tissue paper. 3. Build a den in your garden out of long pieces of wood and blankets. 4. Build a house for bees with wooden tubes and flowers. 5. Tie pool noodles together and lay a blanket on top to make a large float to sit on. 8 Comments on "Summer Activities!" Thanks for all the ideas Tia! I’ve got to try some of these. Some excellent ideas there Tia – I particularly like the leaf stepping stones. I like the sound of Kick Crochet. I will do all these things as well as the Kick Crochet. Good article I am going to try kick crotchet. I am going to do some of these in the holidays and good article. Some really good ideas i really liked the stepping leafs. Good article I’m going to try these later in the week. I love summer! A lot of time of school! All Iv’e ever wanted! Aarzoo Hussain on Rice Krispie Buns and Plain Buns. Aarzoo Hussain on How To Make The Perfect Curry!!! Marko m on Things to make you laugh and jokes!